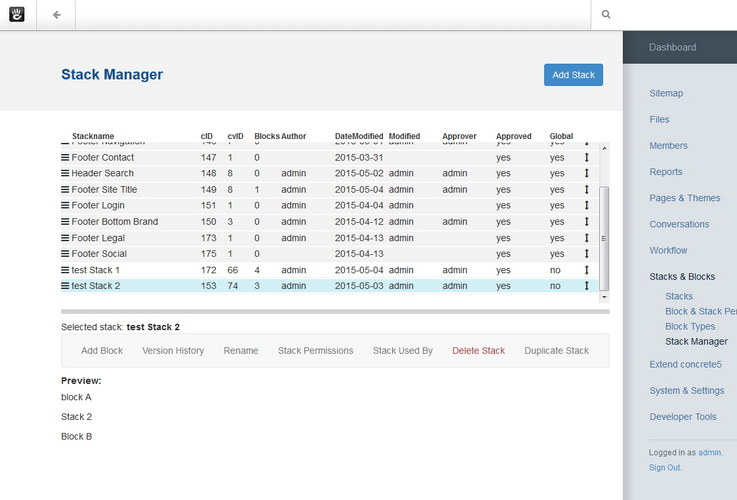 Stack Manager is now also availabble ffor concrete5 v8.1 and up. These docs will be updated soon. Stacks have many great uses in concrete5. With Stack Manager, you can now preview, edit and check all your stacks and global area's in one view. Stack Manager will save you a lot of time. Less reloading and fewer clicks ! a menu button when editing (top right, next to the search field). You will see an overview with all your site's stacks (and global area's). A lot of info is available. In normal use, you won't need all of it, but some of it may be handy at some point. You can sort the table on all fields. Want to find unapproved stacks ? Just click on 'Approved' and see them all in one glance. You can resize the table at the bottom. Want to see more stacks ? Or want to see more content ? Just adjust the size. Move - Click and drag to change the order of the stacks. When you do this, the order will change permanently (when you look at the stacks in ´/dashboard/sitemap/full´ (with ´System Pages´ enabled) you will see the changed order). The currently selected stack will be displayed here. (also the highlighted stack in the table). Needs Workflow Approval - If you have permissions for it, this button will link you to the ´/Workflow/Waiting for me´ page. Here you can preview and edit your stack's content. The big advantage is that you can do this all within Stack Manager ! This will save you a lot of clicks and reloading time.